The Duval property is composed of one block totaling 46 claims covering a total area of 2,458.92 hectares and covers a distance of about 7 kilometres along a SW-NE axis. The Duval block is contiguous to the Valiquette block to the northeast. It lies about two kilometres south of the Route du Nord and is served by a Hydro Quebec power line and a gravel road, which cross the southern half of the block in a southeasterly direction. The Duval block can be accessed by the road leading to Lac des Montagnes and then by boat. An old winter road along the SE shore of Lac des Montagnes has been refurbished and can be used for winter drilling on the property. The Duval project offers strong lithium potential in a well-established area. The lithium pegmatites tend to occur in swarms in the volcano-sedimentary units. The Duval property covers a large part of the regional volcano-sedimentary unit, a favourable unit that hosts Nemaska Lithium's Wabouchi deposit and the Lemarre showing. Located in the northeastern part of the Superior geological province, and more specifically in the northeastern part of the Lac des Montagnes Formation, the Lac des Montagnes volcano-sedimentary belt is a sequence of aluminous metasediments and amphibolites containing basalts and ultramafic sills. These rocks are highly sheared and cut by 20% late granitoids (leucogranite and biotite pegmatite). The property is located in the middle part of the Lac des Montagnes volcano-sedimentary formation. In the vicinity of the Duval block the formation width is about 8 km and its orientation NE. It is locally composed of amphibolite quartz-rich paragneiss, biotite and sillimanite-bearing schist, pegmatite, basalt and ultramafic intrusives. Geophysical surveys show the signature and extent of ultramafic intrusions and iron formations, with some of them confirmed by historical drilling. 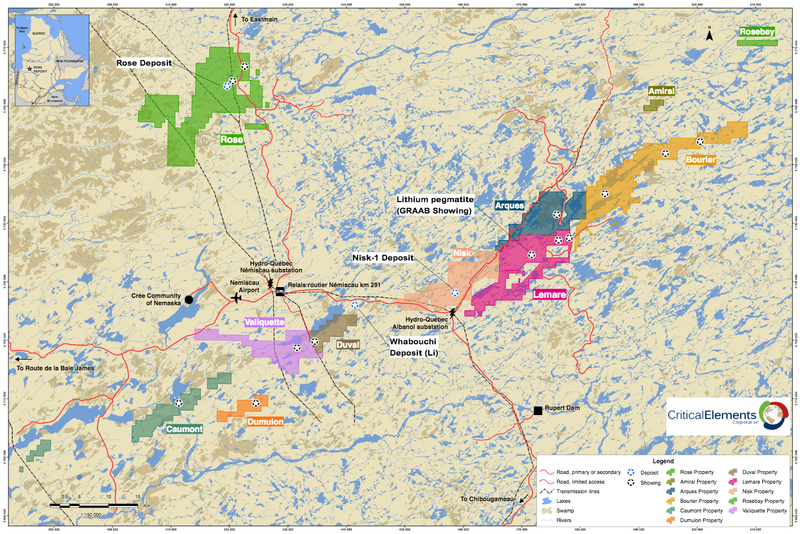 As the Duval property is located in the same geological environment than the Valiquette property, it is currently recognized for its magmatic nickel (Ni), copper (Cu) and platinum group elements (PGE) potential.